Our garden beehive is back up and running! You should see ladies coming and going from the hive entrance now. As always, you can get close to the hive and watch them work, but please do not open the hive lid or disturb them, especially while they adjust to their new home. 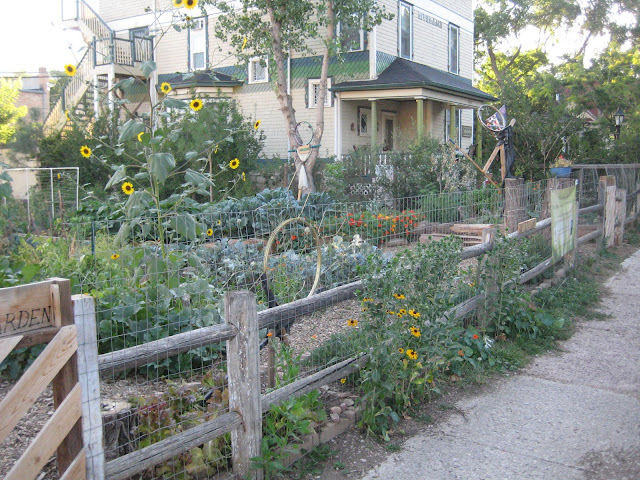 Once the garden is in bloom, you’ll be able to see the ladies at work all over the garden along with other flying friends, pollinating our veggies and helping us have a great harvest. As many of you know, we lost our hive over winter. It does happen, unfortunately, since we have such harsh winters here in Colorado. David and I were lucky enough this year to have a hive at home that is doing well, much earlier than usual, due to how unseasonably warm the spring has been. And, this luck for us meant luck for the garden hive as well! In the springtime, when colonies of bees reach a very high population, they will go through a process of swarming. This is a natural method of population expansion and colony health. A productive hive will send off about half of its population, and their queen, to find a new home and create a new colony. The remaining population raises up a new queen and continues to thrive, with a bit more room in their home. 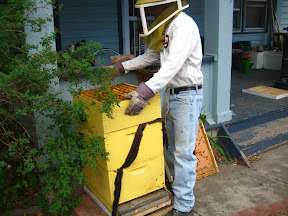 Here is David opening up our hive at home to begin the split process. The boxes of the hive that you see there are full of removable frames of wax comb. 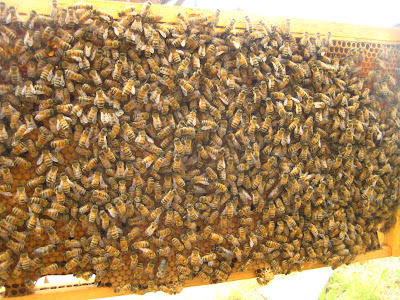 In some of the frames, the workers store the nectar they gather and the honey they produce; in other frames, the queen lays brood which is then cared for by the workers until they hatch. How do we know our hive was at a high enough population to swarm? 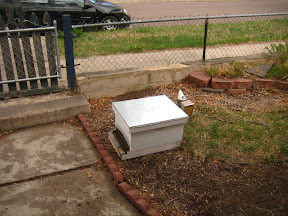 This is a picture of the bottom box, once it was opened and THAT is a lot of bees! You can tell they are overcrowded since so many bees are visible on the tops of the frames, instead of remaining on the comb itself that is below them. David and I went through our hive boxes and pulled out certain frames. 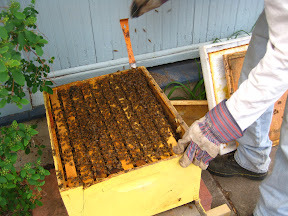 We selected a few frames that had brood on them and a few frames that had nectar and honey. 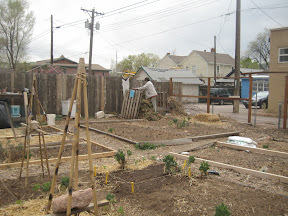 Our goal was to provide the garden hive with some food stores to get them started and some population to build from. Basically, we ‘created’ our own swarm. Here is one of the frames that came over to the garden, and it is full of capped brood and covered in nurse bees. Each of those brown covered cells you see are going to hatch a new bee and all those nurse bees are in the garden hive now. 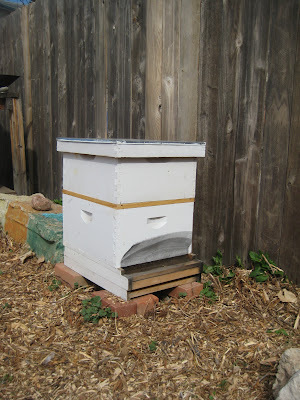 We brought one of the garden hive boxes over the house and had it ready nearby as we chose frames. We placed the frames into that box, so that we could transport everything safely back over the garden. Because we could not remove our own hive’s queen, our goal with the split was to select some brood frames with very young eggs, less than 3 days old. The ladies that moved to the garden will realize they do not have a queen, and will move one of the eggs to a special cell they build and will raise up a queen of their own! 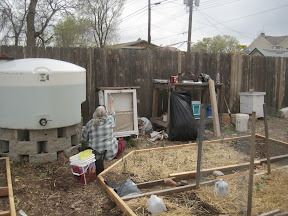 Once we had finished putting the full box onto the garden hive, Pat (who was there, along with Rose, when we brought the box over) noticed that a drone had hitched a ride over to the garden on my back. 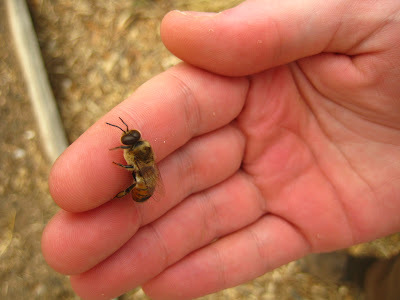 Drones are the male bees and you only see them in early spring, when queen bees are flying to mate. They are much larger than the worker ladies and have big, huge eyes. They have no stingers and cannot forage or work, they are only there to breed with queens. David coaxed him off my back and held him for a while, then passed him over to me. He roamed around for a while on my hand and then decided I just wasn’t his type, and flew off to find a girl more to his liking. Thanks for reading everyone, and next time you’re in the garden, make sure to say hi to the ladies and wish them luck in raising their queen! 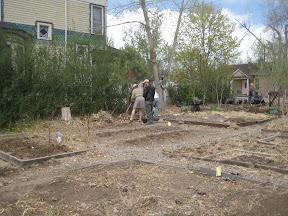 The garden had our first workday of the year to get in some early spring cleaning and start preparing our beds for planting. It was a very good day with lovely weather, not to cool and not too breezy, and we got so much done, the garden looks like a different place! We cleared out weeds and garden waste, cleared beds of last year’s old plants, chopped and turned our compost, repaired the fences where needed, and spruced up our communications sign. 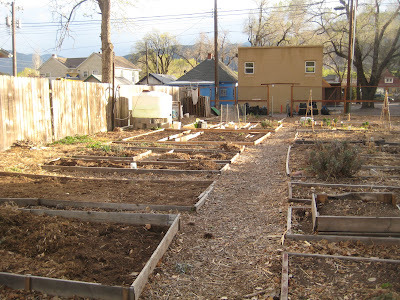 While the workdays to pull the weeds and make repairs and hoe and rake and haul trash can be tiring, it’s an important part of our community garden. It brings us all together when during the year we may not see each other much with all our varying schedules. We have a chance to chat and share while we work and helps remind us that we are all in this together, to make our garden beautiful. I also noticed how much the passersby enjoyed seeing us all there. 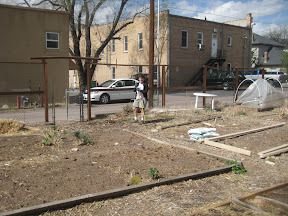 We got many smiles and waves, and people stopped to talk to us about gardening and sharing their stories of gardening. 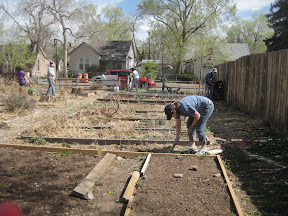 We were definitely out in the community, being a part of it, and that is what our garden is all about! It looks rather bare now since we’ve still got some months before production, but it’s already looking like a great season in the garden. Thanks for checking out our website! This is a work in progress, so check back often for updates and changes.